An award winning variety with upright growth habit & fine foliage on new red tinted shoots. The foliage appears very delicate yet like all the Acers it's a tough hardy plant. In Autumn the foliage takes on yellow & red hues. 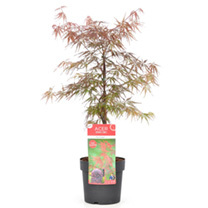 One of the best varieties and outstanding for use as a small specimen tree. The Japanese name translates into ''green dragon'' and also goes under the name of Emerald Lace. Supplied at up to 60cms tall in approx 3 litre container. A striking japanese maple due to its variegated leaves which are pink, purple and green during spring. In summer its leaves are green with a white border and in autumn it turns pink-red again. Height 101-150cm. HP - Hardy perennial. Supplied as a 30-40cm plant in a 3 litre pot. A superb ornamental tree with plenty of seasonal interest. Acer capillipes is commonly known as a Snake Bark Maple for its exquisite striated bark, which is green, streaked with silver when young. With maturity the bark ages to grey with the same silvery markings. Visually stunning autumn colour, the green toothed leaves during spring and summer turn to stunning shades of red. 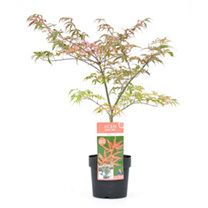 This slow growing hardy deciduous tree or shrub is ideal for both a sunny or partially shaded site, the red leaves being more intense in a partially shaded position. 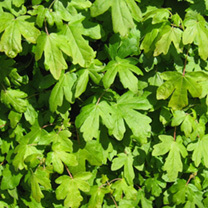 Delicate, finely dissected foliage in a rich emerald green, tinged slightly with red make Acer ?Emerald Lace? a fine specimen plant in any border, woodland garden or even planted in a large container as a focal point on a patio. Acers are slow-growing trees but they will provide years of colour and interest whether grown as a Bonsai or as a full-sized tree.